Malope trifida ‘Vulcan’. A Hero Of The Cutting Patch. …photos never do this flower justice. I wish more folk would get into growing Malope trifida ‘Vulcan’…it’s easy to grow from seed and it breaks hearts at forty yards. It was my Great Great (and some) Uncle Davye Fillius Higgledy, the famous Elizabethan Lute player and smooth jazz flautist, who first grew ‘Vulcan’ to wear in his hair during gigs at the new and trendy Globe Theatre. A large wreath of ‘Vulcan’ was placed on his grave after he came to an abrupt end when a complex disco manoeuvre involving his flute and a dancing bear went terribly wrong. 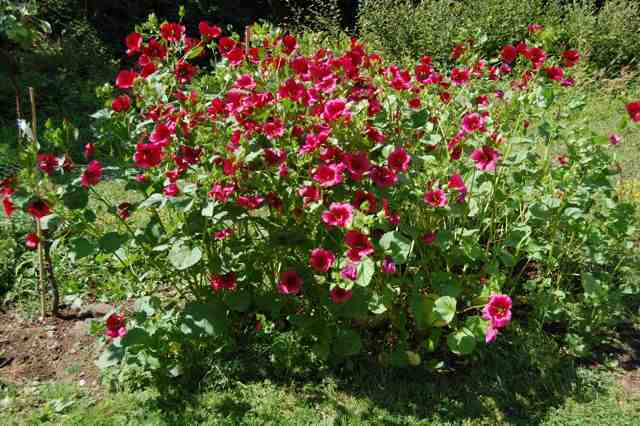 Malope trifida is becoming slowing popular again and it perhaps will return to being a cut flower patch great. Its magenta petals have a silky vibe about them and they are set off by a lime green star in the centre….lip smacking gorgeous….which reminds me…the petals are edible too…..drop them into a salad and your guests will go toffee eyed and dream of one day being just a little bit like you. *You can direct sow straight into the soil outside after the frosts have done their worst….about mid May. Thin your seedlings to about a foot and a half apart. *Or sow some earlier in modules or pots….I sow some at the beginning of April….then plant them out six weeks later. *Only lightly cover the seed…don’t sow too deep. Lovely heart shaped seedlings….bless em…. 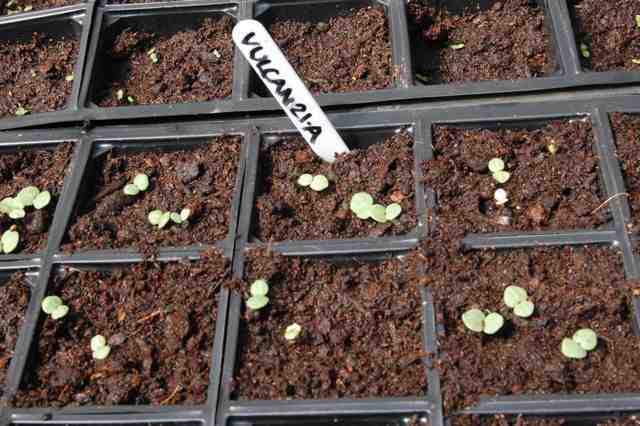 These are the seedlings of the same flowers below…sown 21st April. *They like lots of sunshine. *You can easily harvest the seed but that would mean you wouldn’t come back to me for some more….so don’t do that. Malope are super easy to grow from seed and will work really hard for you producing buckets of flowers all summer long…I don’t know why they are not grown more often…so go forth and Vulcinate dear chums! 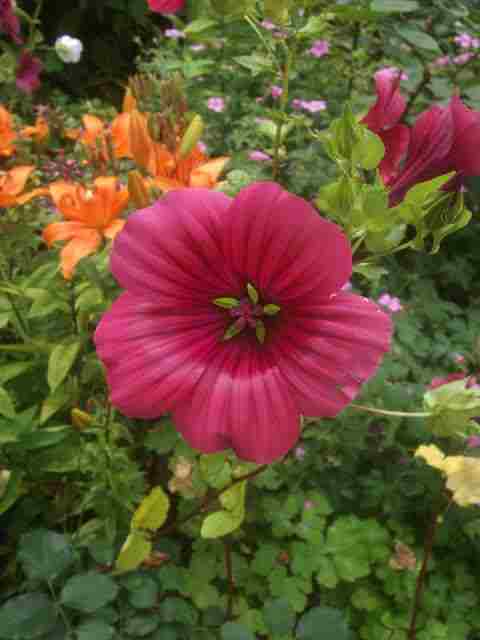 I of course sell Malope ‘Vulcan’…£1.95 for 70ish seeds. Helichrysum. Strawflower. ‘Copperhead’. Ammi visnaga. Queen Of All She Surveys.